With several cities known for their coffee shop culture or famous roasteries, it’s no wonder that North America features some of the most unique coffee shops in the world. 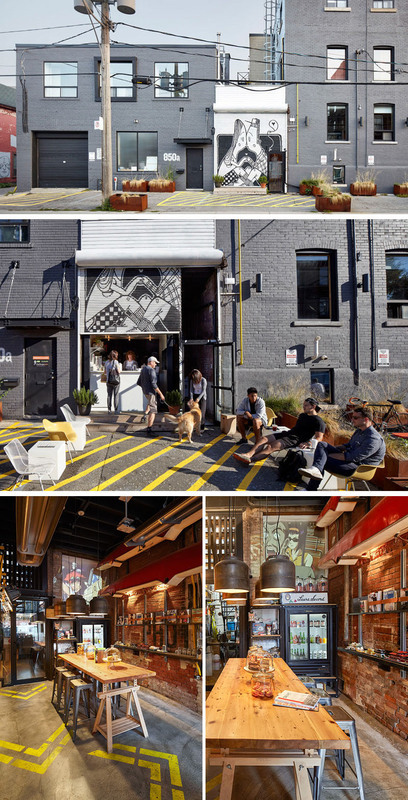 Today we’re sharing 10 coffee shops and cafes to inspire your next coffee driven adventure. 1. 3six0 Architecture designed Dave’s Coffee, an espresso bar and coffee shop in Providence, Rhode Island that features aged cedar boards on the walls and ceilings. See more photos of this coffee shop, here. Photography by John Horner Photography and 3six0 Architecture. 2. Steven Fong Architect and Lorne Gertner designed Tokyo Smoke Found, a coffee shop and showroom in Toronto, Canada that was created to fill a small gap between two converted warehouses. Original artwork, industrial elements, and a collection of unique items from around the world give this coffee shop a quirky vibe and make it the perfect place to gather with friends. See more photos of this coffee shop, here. Exterior Artwork by Alex Senna. Photography by Ben Rahn/A-Frame. 3. UM Project and Ghislaine Viñas Interior Design designed Happy Bones NYC, a boutique coffee shop in the SoHo neighbourhood of New York that puts a twist on the traditional cafe style and instead opts for a brighter, more industrial look that features art and publications from around the world. See more photos of this coffee shop, here. 4. jones | haydu designed the Coffee Bar, a cafe in the Financial District of San Francisco with a modern, unique vibe that brought life into a space that had been empty for over twenty years. See more photos of this coffee shop, here. 5. 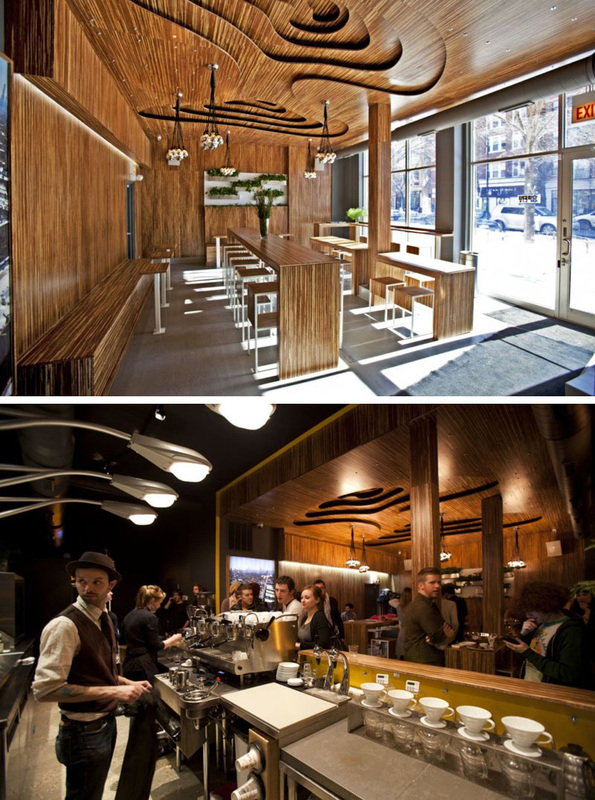 Norsman Architects designed this coffee shop in Chicago, Illinois that’s covered in wood and features light fixtures above the espresso bar that look like the kind you’d find on lamp posts. See more photos of this coffee shop, here. 6. Arcsine Architecture designed Modern Coffee, a coffee shop in Oakland, California with a fun interior, featuring a stylish pattern floor, and a wide range of seating options to allow for casual conversation, quiet people watching, or collaborative work. See more photos of this coffee shop, here. 7. 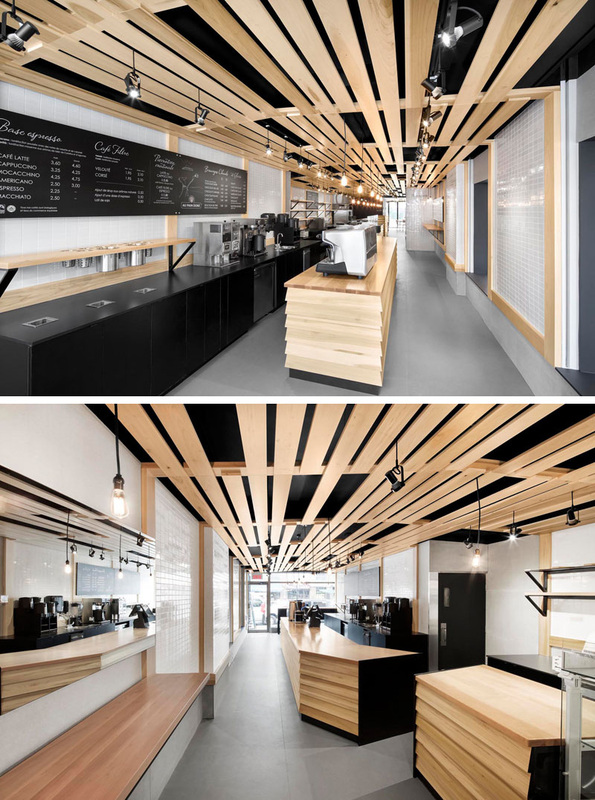 NatureHumaine designed Au Pain Doré, a cafe and bakery in Montreal, Quebec, featuring black cabinetry and light wood slats that pay tribute to the lattice of traditional wood bread baskets. 8. 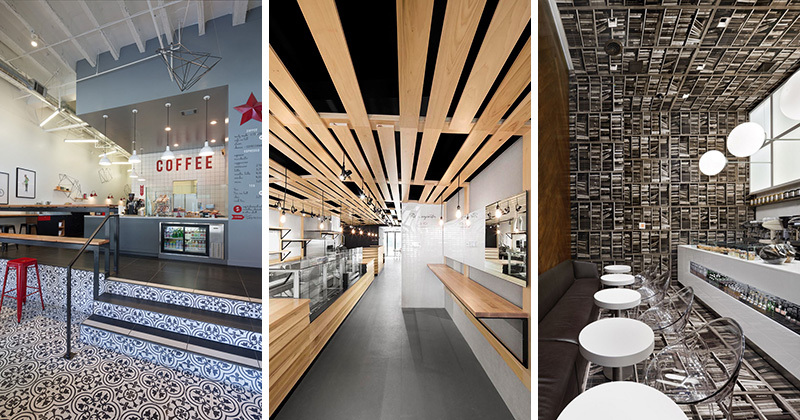 Michael Green Architecture designed Matchstick, a coffee shop in Vancouver, British Columbia. With a mostly white interior, large windows allow natural light to pour in and compliment the use of natural wood throughout the space. 9. Front Studio designed the renovation of McNally Jackson Cafe in Manhattan, New York. The cafe attached to the McNally Jackson Bookstore features wallpaper made from pages of books and a light installation with hanging books sprinkled throughout it. See more photos of this coffee shop, here. 10. Nema Workshop designed this small espresso cafe in New York City to look like a library flipped on it’s side – with herringbone wood walls, wallpaper on the floor, ceiling, and far wall, and light fixtures sticking out from the wall above the bar. See more photos of this coffee shop, here.